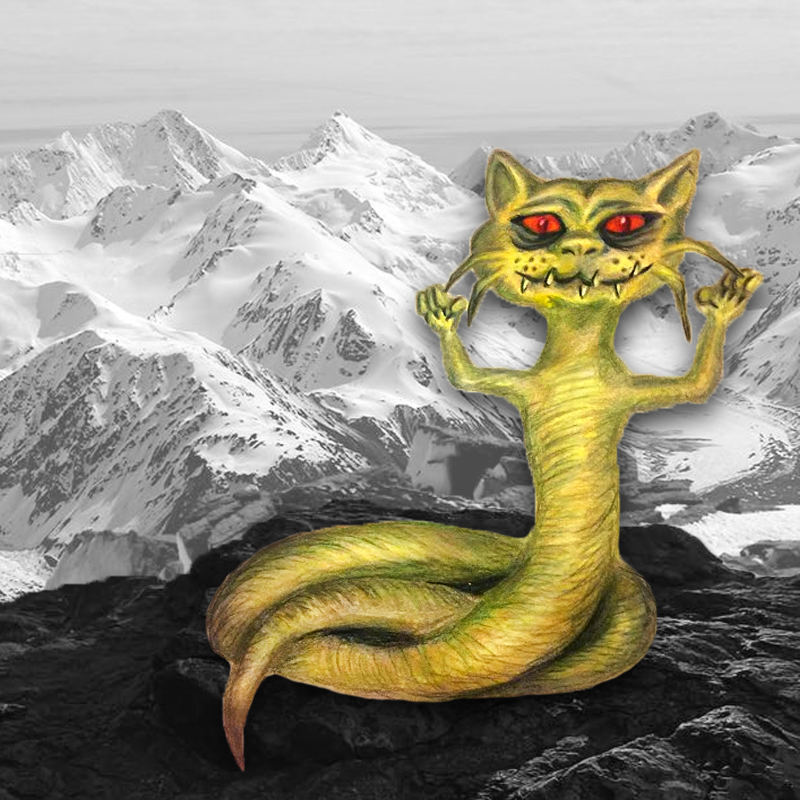 The Tatzelwurm is said to stalk the European Alps, ranging along the mountains from Italy to Germany. This cryptid is most often described as a scaly, serpentine creature with two forelegs, but no hind legs, and a cat-like face. It reputedly has an extremely venomous bite, and some say this dragon of the Alps can even breathe poisonous fumes on its victims. Stories of the Tatzelwurm have circulated since at least the late 18th century, when a man named Hans Fuchs reportedly saw two of them in 1779. As the story goes, he was so frightened by his encounter that he died of a heart attack--but not before being able to provide a deathbed confession to his family of what he had seen. Fuchs is said to have described the monsters as between five and seven feet in length, with the bodies of snakes, clawed paws on their forelegs, and large feline heads sporting razor-sharp teeth. Other tales of the Tatzelwurm have appeared since, with a peasant in 1828 purportedly finding the corpse of one that had been half-eaten by crows; a photograph of a snake-like creature with clawed arms and a large head that was donated to the Geneva institute of Science in the early part of the 20th century; and another photograph said to have stemmed from an encounter a Swiss photographer named Balkin had with the cryptid in an alpine forest. Balkin's photograph initially generated interest, but the picture of a strange, stubby creature among the rocks and logs is widely dismissed as a hoax--as is the skeleton photograph. A later photograph of the Tatzelwurm by a Bavarian mayor that appeared in the 1960s was similarly dismissed as a hoax; likely perpetrated to promote tourism. Decades later, in 1990, a lizard-like skeleton was said to be found by two naturalists in Italy, and in 2000 a skeleton said to belong to a Tatzelwurm was sent to the Geneva Institute of Science, along with a sizable donation. The law firm of Gunterhaus in Germany handled the donation, and refused to divulge the name of its mysterious benefactor, or why the institute in Geneva was chosen as the recipient. There have also been reports in the Tresivio area of Italy, near the Swiss border, as recently as 2009; although those were largely written-off by authorities as rogue monitor lizards that had escaped or been released by their owners. Cryptozoologists speculate that the Tatzelwurm could represent a hidden species of salamander with characteristics similar to Gila Monsters--a comparison not unheard of in nature, given that Tiger Salamanders are often mistaken for Gila Monsters. It is further speculated that perhaps the creature hibernates through the cold alpine winters, emerging in the springtime to frighten Europeans high in the Alps. So if you find yourself climbing Europe's most famous mountain range, keep your eyes peeled for a snake with the head of a cat; and if you do find yourself face-to-face with the Tatzelwurm, make sure to hold your breath, lest you succumb to its deadly vapor--and maybe wear clothing thicker than giant lizard teeth, just in case.